First CSA pickup tomorrow! Tuesday June 5th! Posted 6/4/2018 3:46pm by John and Aimee Good. The 2018 CSA harvest season begins! Your first CSA pickup is TOMORROW! *Please note, if using GPS, it will take you about 1/2 mile down the road. Please watch the mailbox numbers to find us, and look for our farm sign by the road. June is the month of greens! Fresh spring greens are the perfect cleansing and nutritious food after the winter. Green salads, soups, and more coming your way! Salad mix Our special salad mix is cut from mini heads of multi-leaf (very dense) lettuces, for the best flavor, texture, crunch, and keeping quality! Bok choy Separate leaves by cutting off stem and wash thoroughly. Chop stems and greens. Cook stems first, until just crisp-tender, then add greens and cook only until wilted.Delicious sauteed with ginger and garlic, or olive oil, lemon, and salt (my favorite). It is also great in broth-based soups such as Miso or Chicken noodle soup. Hakurei turnips (pictured here, prior to washing. Don't worry, yours will be clean!) 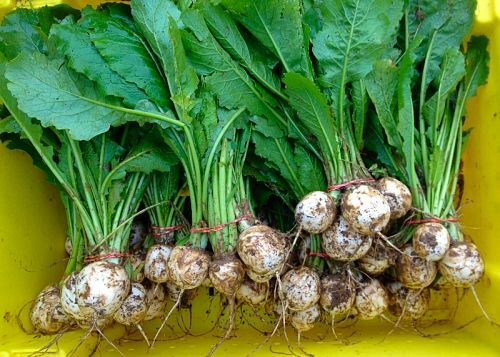 This special Asian variety of turnip is quite mild and almost sweet. Slice thinly for salad or stir-fry. To roast in the oven: cut into halves or quarter, toss with olive oil and salt, and bake at 425 for about 20 minutes, until tender. Roasting carmelizes the sugars in the turnips and is a real treat. The greens are also delicious. I like to saute them with onion and bacon. Lots of recipes on our page for turnips. Enter "turnip" into the search box. **Asian spinach is an asian green with a mild flavor and taste similar to spinach. I like to mix it with the lettuce mix for salads. You can also cook it like as you would spinach. Unlike spinach, it does not have oxalic acid and people who have a hard time with raw spinach can usually handle Asian spinach well. Upick: Strawberries, parsley - check UPick board for amounts! Reminder: Please bring scissor for herbs and containers to transfer your berries into to take home. Thanks! *Strawberry picking will be the flag system - read instructions on UPick board and ask for help if needed! You start at an orange marker, pick in the direction listed on the board. Move the orange marker to where you finish your box/es. Thanks! *COOPERATIVE SHARES: Cheese, eggs, bread shares this week! Please check off your name on the appropriate sign-in sheet and retrieve your shares from the cooler or display hutch. Please ask if you need help! CSA EXTRAS: New this year! Every week we will post a list of any vegetable items that would be available to purchase extra. Look on the sign-in table for weekly items and prices. We are trying this based on members' requests last year and in surveys. Let us know how it works, and if it helps your meal planning for picnics and special events! *Still time to sample and sign up for extra shares: Breads from the Daily Loaf, Cheeses from Valley Milkhouse, and Fruit from County Line Orchard, organic pastured eggs from Spring Creek Farm. You can sign up in the barn or by updating your membership. Bread, cheese, and eggs will be pro-rated, as they start this week. Cheese is biweekly, bread and eggs are weekly. Fruit will begin in July, and mushroom shares will be offered this fall. Enjoy! *Local goods available for purchase: Good Farm salsa, pasta sauce and ketchup, grassfed beef, organic pastured eggs, Wild Alaskan salmon, local yogurt and butter, local honey. Cheeses, maple syrup, locally roasted coffee, and more meats coming soon! *If you missed the CSA Pickup Instructions Email last week, please read below. Thanks! We look forward to seeing you all tomorrow! Driveway/Parking Instructions: At the turn onto our driveway, you will cross a small drainage ditch. Please be careful when crossing. Only one car can cross this at a time! Our driveway is long and narrow. If two cars need to pass, please use the grass lanes on either side of the drive as pull-off areas. Main parking is in the gravel lot directly in front of the barn. Extra parking is in the grass lot across the driveway from the barn, directly in front of the Upick garden. Pickup Instructions: Please enter barn through the side door. Please check off next to your name on the "sign-in sheet" every week you pick up your share. Your share members are %%member-label%%. If this is a shared membership, you must alternate weekly pickups or meet at the farm at the same time to split your share weekly. All the vegetables will be in the barn, with signs indicating the amount each share size is allowed to take. Scales are available for weighing produce where required. We ask that members bring their own bags and/or containers to take home their produce each week. We do have a box of extra bags available for those who forget, and you can bring your extra plastic bags here for other members to re-use. Our wonderful CSA helper Heidi Cooper will be on hand to help you and answer any questions! The Upick garden will be open soon with berries, peas and herbs - watch your emails and the Upick board in the barn! Extra products will be available for purchase by members in the CSA pickup barn, all local and naturally raised: Good Farm salsa, pasta sauce, and ketchup; local honey, eggs, bread, cheeses, yogurts, and grassfed beef, Wild Alaskan salmon, and more! Cash or check only. Please Note! The Good Farm is a working family farm. For the safety of all, we ask that members and their children stay within the barn area and Upick gardens, and that dogs be on a leash at all times. Members are welcome to walk the fields by request. Thank you! Member updates: Please keep an eye on your inbox every week for the harvest update. You will receive a weekly email, beginning next Monday evening, with a list of the vegetables which will be in your share, as well as storage and cooking tips, recipe ideas, and news from the farm. Thanks! We look forward to seeing you all next week! First vegetables will include lettuce mix, spinach, bok choy, kale, Hakurei turnips or radishes, and possibly scallions. Berries may be ready to U- pick! Can't wait! News & Blog - Missed an email? Want to review an old one? You can find all our email posts here in our blog archive. Recipes - Every week we post new recipes highlighting the vegetables in your share. Most recent additions will be at the top of the page, but we have quite a lot of recipes on this page, and you can search by vegetable to find many more ideas!